Go to the following URL: https://www.google.com/chrome/ to begin the installation process. Click on the "Download Chrome" button to begin the browser download. Scroll down and read through the terms and conditions. When you reach the bottom, you can click the "Accept and Install" button in the bottom left of the screen. You may wish to uncheck the "Help make Google Chrome better by automatically sending usage statistics and crash reports to Google". 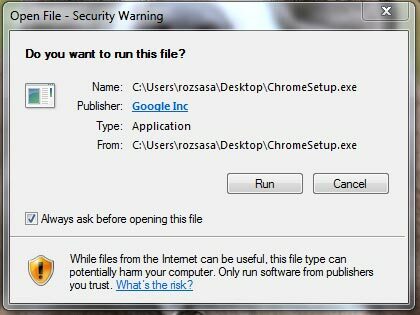 When the download is complete, you will see the "ChromeSetup.exe" in your downloads. Double click the installer icon and begin the installation process by clicking the "Run" button. The software will begin installing and will show a progress bar. When the installation is complete you will receive a completion pop up box. Locate the Google Chrome icon on your desktop and double click it to launch the Google Chrome Browser.